Effectively shield your little baby from harmful uv rays with this baby sunhat. Perfect protect your baby's head,eyes,face, neck from any sunburn. It is practical and comfortable to wear for Late Spring/Whole Summer/Early Autumn. Easily to pair with most outfits and make your baby pretty adorable. 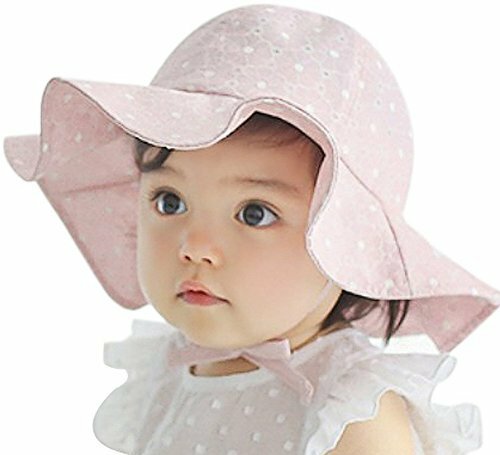 Baby's skin is very sensitive, not good to expose to the sun directly, you'd better use this sunhat with other sunscreen to protect your little one from any unwanted surburn. This hat can effectively block 98% harmful UVA rays. Whether she's having an adventure on the beach, accompanying Mommy on an errand run or exploring the backyard, park, you will be amazed at how adorable your baby is in this sun protection sun hat.